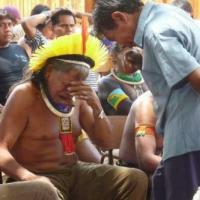 The chief Raoni cries when he learns that Brazilian president Dilma released the beginning of construction of the hydroelectric plant of Belo Monte, even after tens of thousands of letters and emails addressed to her and which were ignored as the more than 600,000 signatures. That is, the death sentence of the peoples of Great Bend of the Xingu river is enacted. Belo Monte will inundate at least 400,000 hectares of forest, an area bigger than the Panama Canal, thus expelling 40,000 indigenous and local populations and destroying habitat valuable for many species – all to produce electricity at a high social, economic and environmental cost, which could easily be generated with greater investments in energy efficiency.